It’s very rare that we pull off a dinner that has such direct connection between the location and the film we’re screening. This was that kind of perfect storm. I moved into my office on 34th and fifth about two years ago. Day two I wandered up to the roof and saw the Empire State Building looking down on me. To my left was the perfect movie screen (found on the side of the building just south). From that moment I’ve been working with the Wework crew, the owners of the building, to make this event happen. 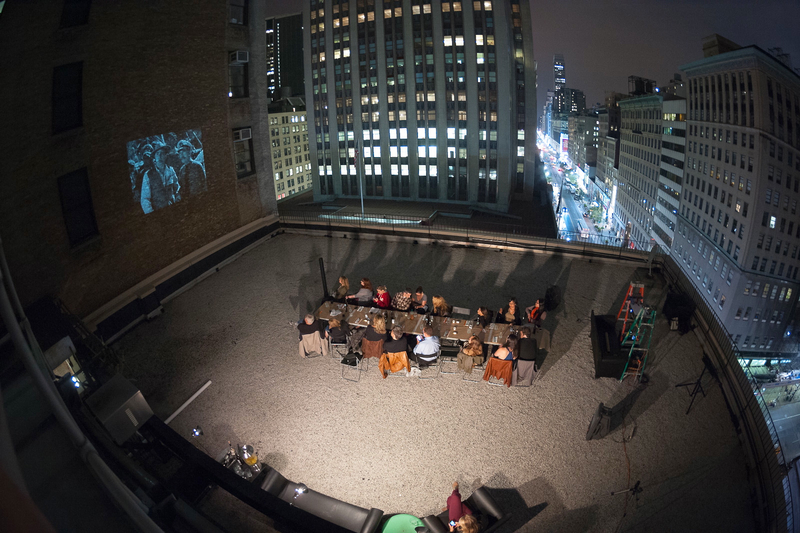 A few weeks ago my vision of Dinner with King Kong under the Empire State Building became a reality. 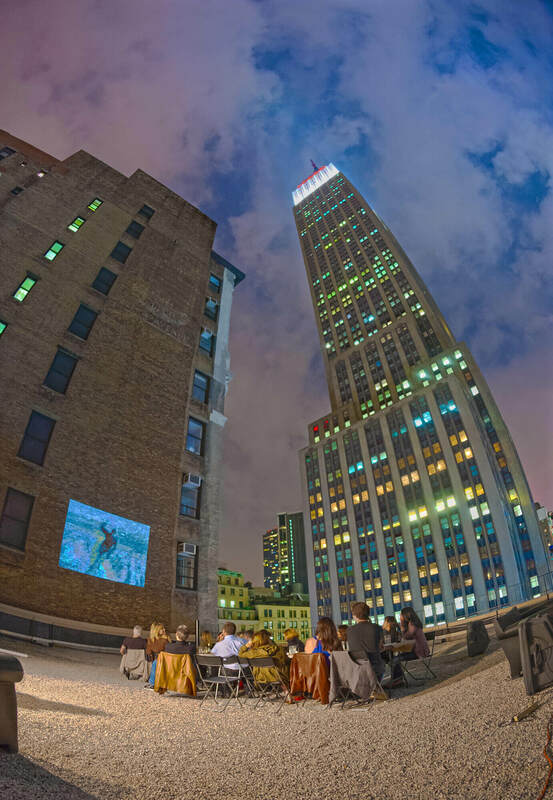 For those who are unfamiliar with our dinners, Reel Tasty is Forking Tasty’s summer supper club where we screen a movie on a 2 story building while our guests sample some of our latest and tastiest gourmet creations. 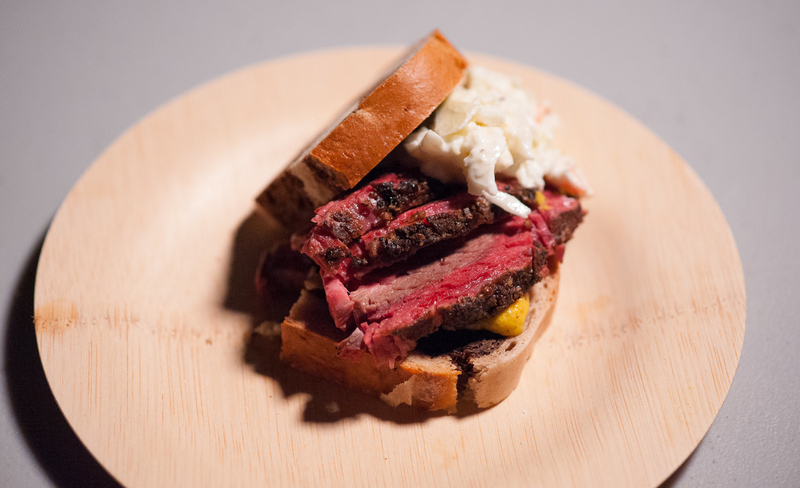 For this one we decided to pick some of our favorite NYC neighborhoods to inspire the cuisine. 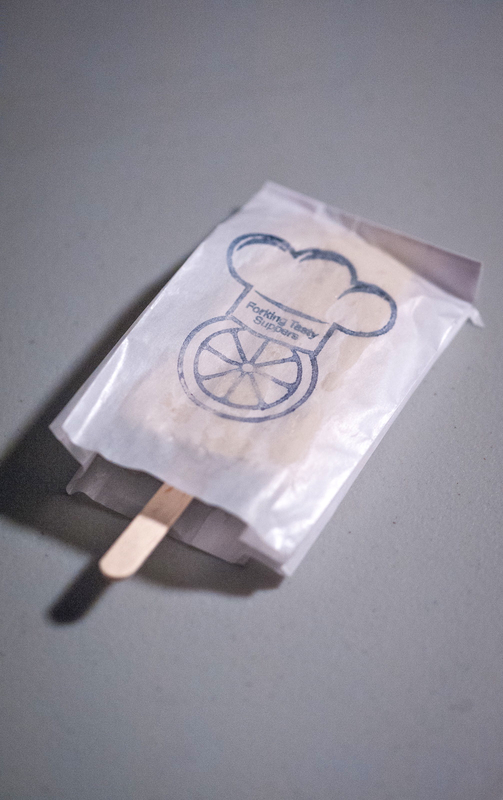 Although we screened the original 1933 film, no CGI for us, we chose recipes that spanned the 79 year gap. Let’s just say that in 1933 the crew didn’t break for lunch in K-Town. As our guests arrived they each seemed to have the same elation I did when first walking into the space. At night the entrance is even more dramatic. Imagine coming to the center of NYC, passing the tourists and being buzzed into a non-descript building across the street from one of the greatest monuments of the modern world. You then take the elevator to the top floor, 8 stories up, leave the elevator and climb one set of stairs to a steel door that is propped open with a piece of wood. As you crest the top of the steps you feel a breeze of cool air, see bright lights and some ominous roof infrastructure. A few steps later you clear the facilities and are left standing in front of a 20 person table staring up at the Empire State Building. As each guest arrived having the above experience they were handed a drink and shown to a mini lounge to await the start of dinner. Shortly after all 20 guests had arrived we seated everyone all together. 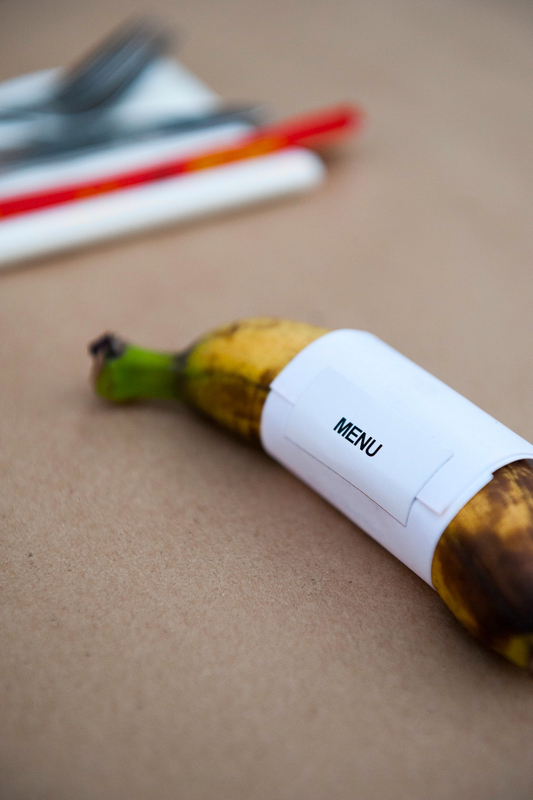 The first step into the King Kong themed meal was the menu. Not a neighborhood but film appropriate just the same. Along with each guests mini banana menu we served a small dipping bowl filled with a cardimum/cumin spice mix. The idea was to dip the banana into the spices to warm up the palette for the neighborhood inspired courses that was about to begin. It’s only fitting that I lay them out for you block by block. So from 34th and fifth here we go. No MetroCard needed. 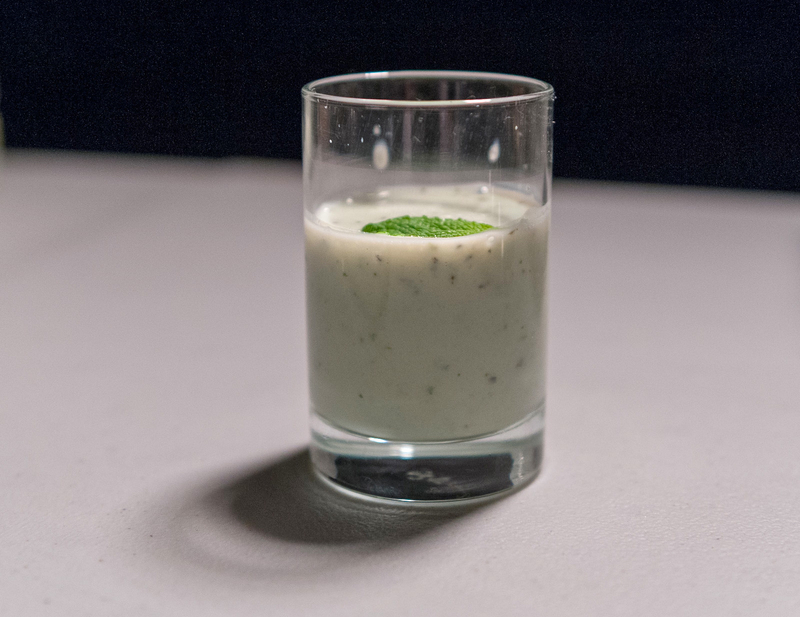 Inspired by @missustasty, my love for Indian food, my original apartment on 30th + 3rd and a love for the marriage between cucumbers and yogurt, we opened the meal with this cucumber lassi. Think salty but fresh yogurt shake with the consistency of a heavy cream. The yogurt is thinned down by the cucumber releasing it’s flavorful water content as the two are blended together. The froth makes it fun and the mint ties it all together. I don’t cook much Asian food. When I do it’s never Korean. So the K-town dish was a challenge. Luckily our prior dinner left me with an authoritative panel of Korean-American’s that guided me in the right spot. 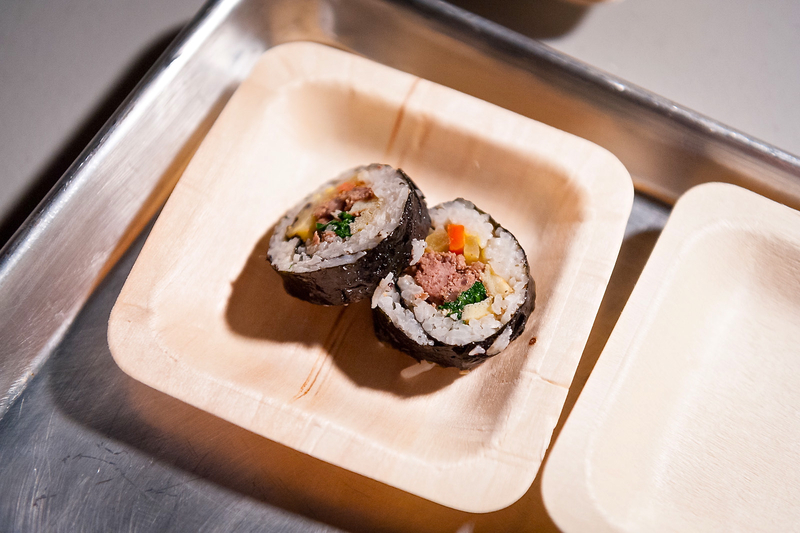 This Kimbap is much like a Japanese sushi roll but can contain anything from kimchi to beef. I used beef and rolled my own. This dish is common for Korean picnics in which it’s served at room temperature. This helped with one small detail missing from this amazing location. No oven! Yes Queens! It’s the new Brooklyn, trust us. 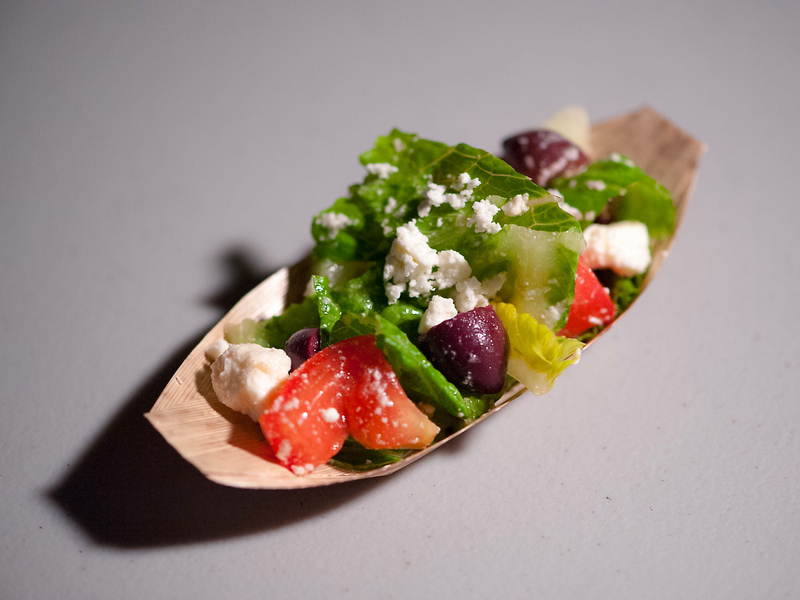 Simple, easy and delicious, this Greek salad was a perfect fit. Anthony lives in Astoria and knows were to get the authentic feta cheese and the freshest olives. The dressing was a simple lemon and olive oil to let the ingredients shine. By this time our guests were deep into the film. Focused on the 1933 black and white the colorful and loud surroundings faded into the background. 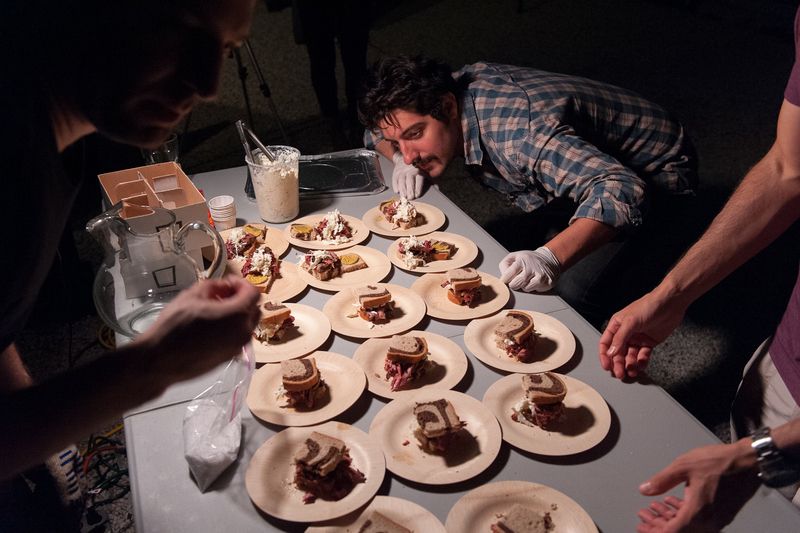 We kept the pace and started plating the Lower East Side. I don’t know about you but I like my pastrami sandwich a very certain way. Hot, fresh rye bread, spicy deli mustard and a dollop of cole slaw is the perfect mix of flavors textures and temperatures. So that is exactly what we did. Plus, how could you do neighborhoods with out representing one of the most multi-cultural blocks in the whole city. You can eat everything from Mexican to modern American to Jewish cuisine in a 5 block radius. Not surprising our main entree represented a neighborhood we hold near and dear. 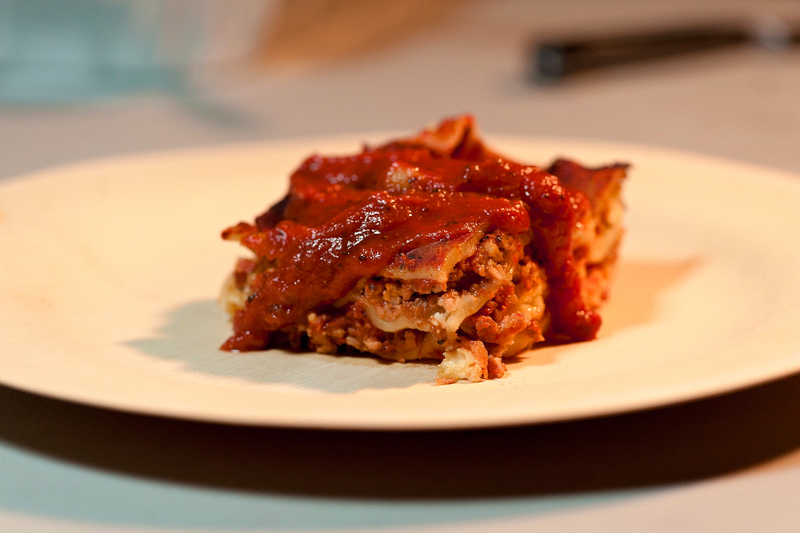 The dish, our signature lasagna. The ‘hood a few blocks off from where our father grew up. Not the 30’s but Greenwich Village in the 50’s would have been amazing to see. When the time machine is invented that’s the first place you’ll find me. For now I’ll settle for my grandmother’s gravy poured over 5 layers of tender pasta, gooey cheese and flavorful meat. We thought it only appropriate to start and end with bananas. Our food finale was served just as the movies finale sent the beast tumbling off the very building our guests dined underneath. 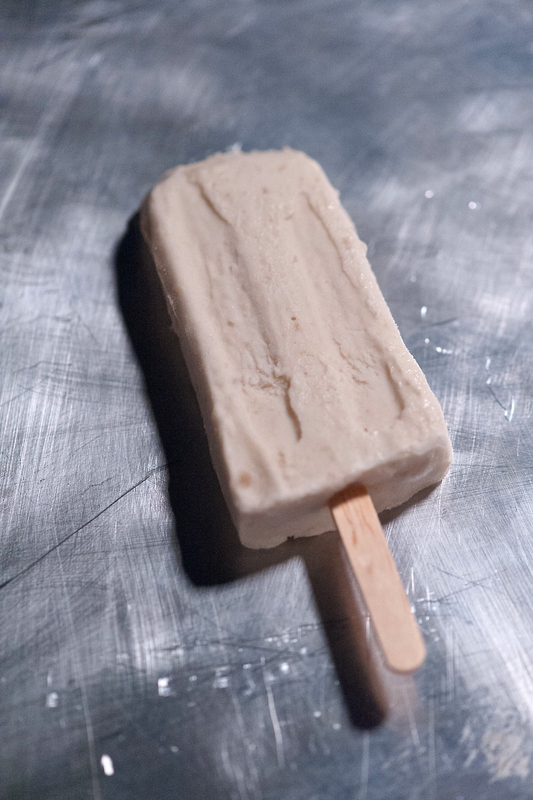 The meal concluded as if halfway through his epic fall Kong turned into delicious banana-marscarpone cream pops that landed on each plate with a thud. With the plates cleaned and the movies credits scrolling the night slowly closed in the same secret way it began. 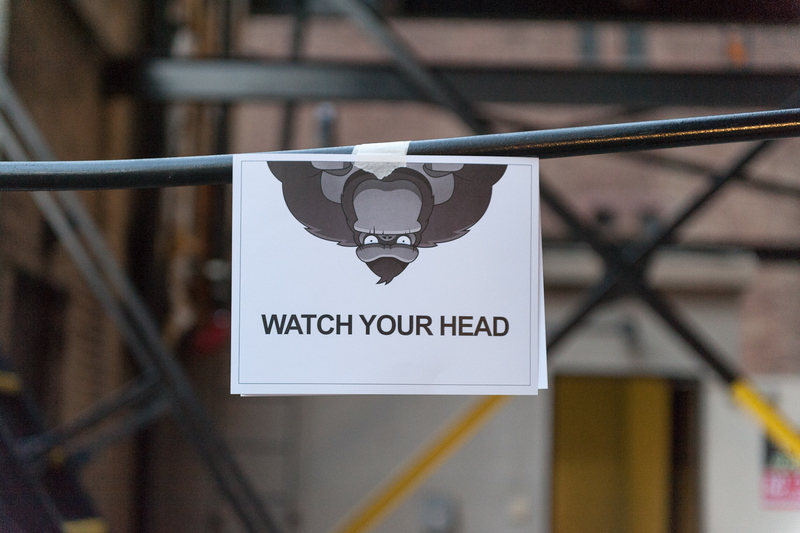 Guests trickled off the roof, down the steps, into the elevator and back onto the street. The door to the building locked behind them instantly making the rooftop a memory and snapping them back into the tourist haven reality that 34th and 5th constantly commands. For us the night was a huge success. Executing what was only a vision a year ago gave us a great sense of accomplishment. That perfect storm of film, food and location all playing equally strong roles in the evening always leaves us beaming. We hope we can bring dinners like this to you more often in the future. We’re working on a couple now as you read this. Of course no recap is complete with out recipes and a shout out to the crew. They are the ones that do the heavy lifting that keeps these dinners going. For this one we had a special paisano in the kitchen to help, Michael Cirino of A Razor, A Shiny Knife. The biggest thanks always goes to our guests. Seeing them mingle and eat warms our hearts and gets us one step closer to our mission of bringing back dinnertime. Our next dinner will be announced shortly make sure you are on the list to get the update. Puree cucumber, ginger, chillies and mint in a blender. Add ice and blend until it is crushed. Add yoghurt and salt and blend until it gets foamy. Pour into two glasses, sprinkle the cumin and cayenne powders and garnish with mint. In a bowl, combine all the ingredients for the beef. Mix everything together by hand and set it aside to marinate while you prepare the other ingredients. When all the other ingredients are prepped, and the beef has had time to marinate, heat a large pan with some olive oil and fry the beef until it is nicely browned. Remove the beef with a slotted spoon into a bowl and set aside. Add the entire 9 or 10 oz bag of ready to use spinach in salted boiling water. Boil for 30 seconds, and drain. Run cold water over it to stop the cooking, and squeeze out all the excess moisture with your hand. Transfer to a bowl and season with 1 teaspoon sesame oil, and a couple pinches of kosher salt. Mix well. Set aside. Slice the log of radish into ½” thick slices. Cut each slice into strips, so that you end up with thin long strips, about ½” thick in diameter. Set aside. Peel and slice your carrot(s) thinly on a diagonal. Lay the slices flat and run your knife through them lengthwise to create thin julienned slices. Saute them in a pan with some olive oil and season with a couple pinches of salt to taste. Set aside. Break 5 eggs and add a couple pinches of salt. Whisk well. Heat a large pan with olive oil over medium low heat. Use a paper towel to wipe the pan so that it is evenly coated. Pour in the eggs and let it cook until the bottom is firm and light golden brown. Flip the egg over and cook until light golden brown. Remove to a plate and cut the egg into half-inch strips. Set aside. Mix the rice last. After all the ingredients are prepped and the beef is cooked, place the 6 cups of cooked rice into a large bowl, along with the other ingredients for the rice. Mix gently, and get everything ready for assembly. Place a sheet of dried laver seaweed, shiny side down, on a bamboo mat. Starting from the bottom, spread some rice in a thin even layer, filling about ⅔ of the seaweed sheet. All of the filling that goes on top of the rice should start at 1” from the bottom, and have 2” of rice above it. Place the danmuji and egg first, leaving a gap in between them. In that gap, add your beef in a neat row. On top of the beef, place the carrot and spinach side by side, also in neat rows. Starting from the bottom, roll the seaweed sheet, using the mat. The first roll should land right where that excess rice is. That will help it stick together. Gently push and squeeze down on the bamboo mat. Move the mat a litttle further away from you, allowing the kimbap to roll with it. Again, squish down and press with your hands. Then wrap and roll the entire kimbap up in the mat. Squeeze firmly across the entire length of the mat to make the sure the kimbap is tight. If you’re having trouble keeping the seaweed shut, add a few grains of the rice at the edge of the seaweed sheet. Use a brush or a gloved hand to put some sesame oil on the surface of the kimbap rolls. This adds flavor and helps keep the kimbap shiny. It also helps to add a little sesame oil to your knife blade. With a sharp knife, slice the kimbap into thin half inch or bite sized pieces. Kimbap is characteristically sliced thinner than Japanese maki. You can then sprinkle with some more roasted sesame seeds if you want.